Youtube has everything. Infinite hunting videos, including a few of mine. Hoping for a find, I searched for “upland bird hunting” videos, and found myself getting increasingly irritated by the overabundance of “shooting preserve” and outfitter videos showing fat rich people shooting birds they won’t have to clean and most likely won’t eat, either. Then I found a longer video about hunting Huns and sharptail on public land in western Montana. Looked authentic, but had suspiciously good production quality and a soundtrack way inside Puddle of Mud or Solid Waste. Promising. I should have turned it off when one of the Kansan talking heads appeared wearing a Garmin shirt. Halfway through the vid there’s a scene with an English setter absolutely blitzing straightline through some brush with the voice-over, “The dogs are really birdy in here…” Really? Cut to the three dudes in glorious late afternoon Montana rays lumbering leisurely through tall grass. 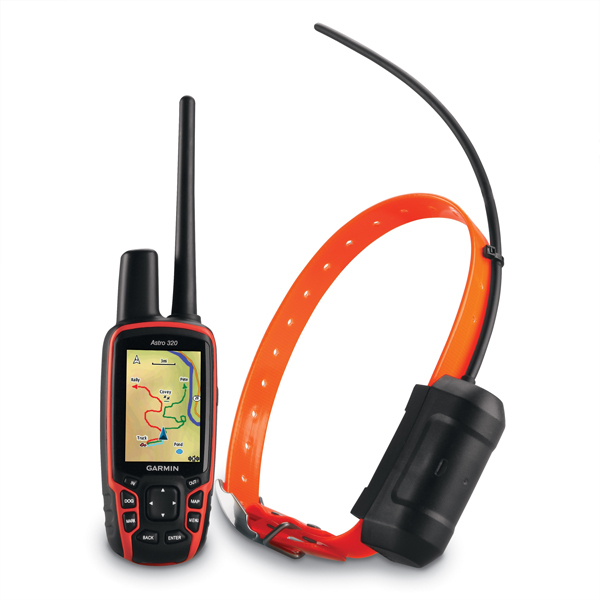 One grabs his Garmin Astro, looks at it for a second, and non-nonchalantly says, “Well, we’ve got a dog on point somewhere close; looks like he’s about 100 yards southwest. Let’s go get some birds.” Cut back to the Garmin guy: “The Garmin Astro has really changed the face of upland bird hunting.” I guess so. Now, as long as you don’t mind the price tag, you don’t even have to know where your dog is. Ever. It should go without saying that this is wrong. What are you doing out there? Why are you hunting birds? If your dog matters to you, why don’t you keep track of your four-legged partner? I see this too often. While running on a trail near my house I encountered a beautiful English setter with a couple e-collars and antennas laced around its neck, sprinting the other way. Over a half-mile later I found his owners, ablaze in hunter orange caps and Orvis chaps. Around their necks hung thousands of dollars of electronic tracking devices, and in the mouth of the patriarch of this bunch was a good ol’ fashioned whistle. 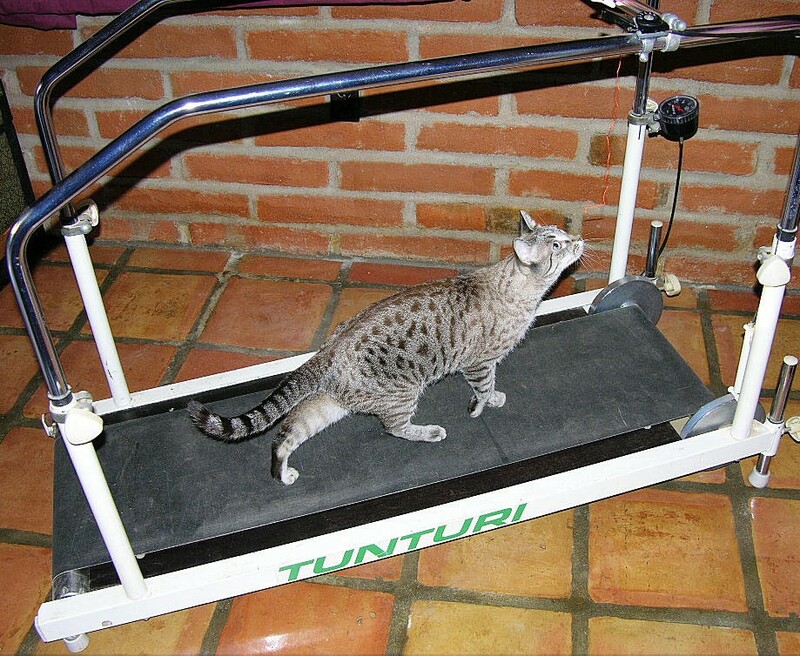 He shrieked on it steadily, at least once a second, turning serenity to sheer sonic hell. About three quarters of a mile behind these folks were two other setters romping around the brush on their extended electronic leashes. I shouldn’t let it bother me. I should look at it as a sign that going after wild birds in wild, hard-to-hunt places is fairly safe. I don’t care that these guys with their technology and hired dogs are the ones flooding the Web with photos of tailgates littered with multi-limits on all available species. To be fair, I use an e-collar on Angus, always have. I use it to get his attention and to reinforce our working relationship by helping him stay close enough to me so I can read him. The best thing about it is that I don’t ever need to call him, and we can hunt quietly. This matters to me. Watching Angus hunt, watching him check to see where I am, to see if I might want him to shift directions, watching him apply his superior sensory equipment to the mutual pursuit, watching him creep, point, adjust, get excited: call me old fashioned, but this stuff is way more interesting to me than looking at a 2.78″ diagonal color GPS screen to see what my mutt’s up to. Bob, x2 and Amen. Why are they hunting wild birds. Agreed. Definitely falls into the category of what it isn’t for me. I hate to say it but we’ll probably see hunting drones next. I say that with a slight desperate laugh..
Bob, like any tool it depends on how you use them and why. 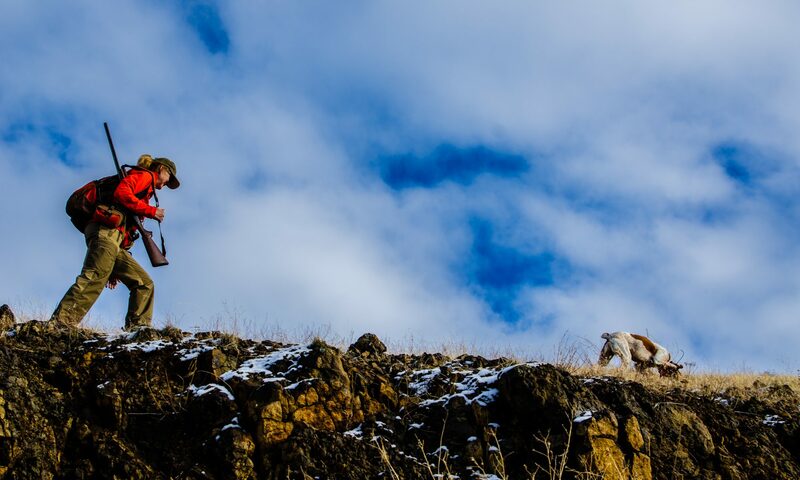 My first season chukar hunting, Callie and I got separated hunting a steep canyon with a bunch of ledges. 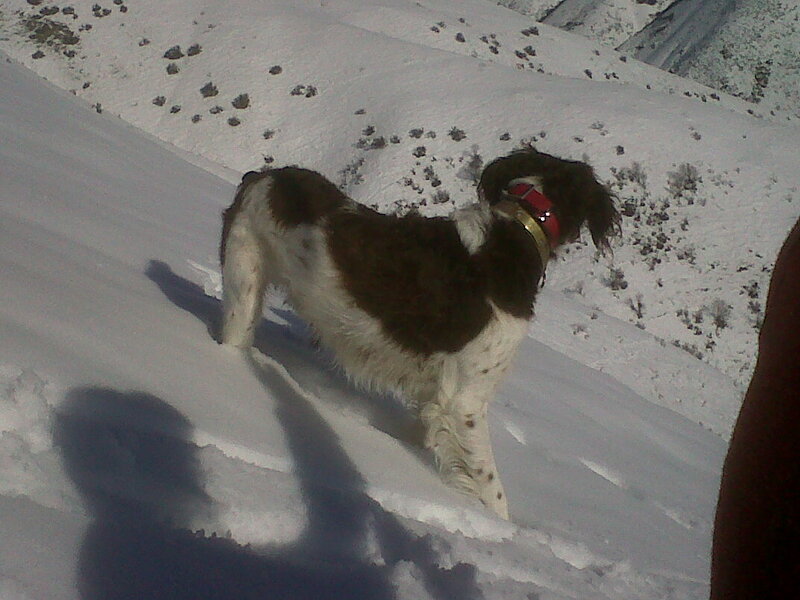 It was getting dark, cold, and she blended perfectly into the snowy terrain. After about an hour of me calling and whistling for her I finally saw her at the top of the rim a couple hundred yards from me. I cried when she finally made her way back to me. Nothing like that has happened before or since, and I avoid hunting those steep bookshelf spots anymore. After that experience I started using a GPS collar and although I don’t use it very often, it is nice to know where she is during those times she is out of sight. Ben, I wrote this post 5 years ago; two years ago, as Angus started aging noticeably and I realized I was missing lots of his points because I didn’t know where he was, and because I was overcome with sentimentality about how each hunt might be our last together, I stole some cash from our savings and bought an Alpha and TT15 collar. I felt dirty. But I use it every time we go, and my stress level while hunting has plummeted because I’m not constantly trying to figure out where both dogs are (yes, Peat has a collar, too). Two weeks ago, Angus disappeared for two hours when he was hunting with my wife two ridges away from me and her transmitter stopped picking him up (yes, she now has her own Alpha). I was able to see Angus and hike over to him. I also am seeing more fur traps in Hells Canyon, so the GPS collars make me worry less about finding dogs caught in traps. So yeah, I need to write another post about this and eat some crow.